Wash and dry fruit and vegetables. Chop apple, walnuts, and celery. Toss with the salad. 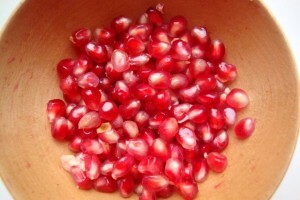 Arrange pomegranate seeds on top. Whisk together citrus juice, olive oil and honey and distribute evenly on the salad.